Dr. Scott Herring, international performer and master pedagogue, will perform with the Stephen F. Austin State University Percussion Ensemble in a concert at 7:30 p.m. Monday, April 16, in Cole Concert Hall on the SFA campus. NACOGDOCHES, Texas - The Percussion Ensemble at Stephen F. Austin State University will welcome international performer and master pedagogue Dr. Scott Herring when he performs with students in a concert at 7:30 p.m. Monday, April 16, in Cole Concert Hall on the SFA campus. "We are extremely excited and fortunate to have Dr. Herring, who has trained some of the finest percussion performers and music educators in the country, perform and give several clinics at SFA," according to Dr. Brad Meyer, director of percussion studies for the SFA School of Music. 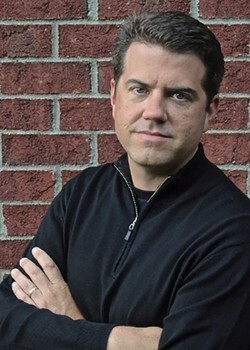 Herring, professor of percussion at the University of South Carolina, will be the marimba soloist on Michael Burritt's "Shadow Chasers." Of the work, Burritt wrote: "In his writing, the English author C.S. Lewis referred to our time on earth as the 'Shadow Lands.' Many implications can be drawn from this metaphor. I have always considered myself, and most people, to be someone who chases after the things of the Shadow Lands (a "Shadow Chaser") rather than those of a higher calling. I, too, often look for rewards here instead of in my relationship with God. This is a battle I will constantly fight." Herring frequently appears as a guest artist with university percussion ensembles across the U.S. He has performed with the Civic Orchestra of Chicago and was a member of the Northwestern University Graduate Percussion Quartet, which performed in Germany and London. Herring also performs with USC saxophone professor Clifford Leaman as the RoseWind Duo. They have given numerous performances and clinics at universities across the country and have been invited to perform at many professional conferences. The duo has performed in France, Spain, Scotland and China. He is also member of the Shiraz Percussion Trio. The program also includes performances of "Ogoun Badagris" by Christopher Rouse; "Furious Angels" by Jeffrey Peyton; "Vespertine Formations" by Christopher Deane; and "Identity Crisis" by Michael Aukofer. "Ogoun Badagris" derives its inspiration from Haitian drumming patterns, particularly those of the Juba Dance, according to Rouse. "Furious Angels" is a "scherzo diabolique" for seven percussionists, the composer explains. The work explores the many permutations of the scherzo, particularly the momentum and rhythmic energy inherent in 6/8 time. Deane explains that "Vespertine Formations" was inspired by the chance observation of flock maneuvers performed by a huge number of birds over the University of North Texas campus on an October evening in 2001. "The wing motions of so many birds suggested the texture of constant 16th notes. As the brilliant orange sunset diminished to dusk, the birds settled into trees around campus. The fantastic choreography created by this flock of birds and the natural chronology of events guided the structure and form of this piece," Deane wrote.